February has suddenly teased us with a promise of spring. Although almost every morning over the past week has started with a crisp frost, it has been succeeded by beautiful blue skies and sunshine that promises something of the summer to come. Although we shouldn’t be fooled into thinking winter is almost over, (think of the Beast from the East last year! ), the garden has responded and there are signs of new growth in all directions, and not always in the obvious plants such as the camellia below. Although the sun disappeared yesterday, I was tempted out into the garden to do the first proper stint of the year. With my still unreliable knee, I had to content myself with some gentle sowing of early peas and rocket in the greenhouse and a little light weeding and feeding whilst John diligently pruned all the roses and gave the acer a significant chop before starting to wield the axe against the pyracantha that has become a monster! Before getting to work, I decided to do a complete circuit of the garden to assess what was shooting, what was reappearing from last year and what, as yet, is still keeping us guessing – again, reminding myself that it is still only the middle of February. Just for the fun of it, I also decided to have my first real play with John’s birthday present – a macro lens! Not being a photographer as such, I found it a slightly strange experience, having to coax it to focus on the small detail I wanted and not something it suddenly found in the distance. I’ve also found it incredibly frustrating trying to load up giant media files to blog with today but that’s another story I think! My perambulations began literally outside the backdoor with a perennial wall flower that I bought as a between seasons gap filler last summer. It flowered its socks off from about May till August. Last weekend I began to realise how interesting foliage was becoming, with this soft, almost grey tinged with a hint of pink. Once in full flower, this will be a mass of vibrant yellow but for now, the tight flower buds at the centre begin crimson, start to hint of orange but then, with a bit of sunshine, turn yellow. Given how early it is starting to flower this year, will it still be in flower in July like last year? Dotted around the garden, a whole range of daffodils are now on the starting blocks and ready to burst forth in the next week or two. The small tete-a-tete do well in our garden, better than the full sized daffodils. However, I spotted a clump of large daffodils today that I don’t remember planting! Just above them, our clematis armandii is starting to bloom. The buds look quite unattractive in their early phase. If that was all you saw when you first came across the plant, I’m not sure whether you would want to give it house room? However, the pure white flowers are so elegant and the scent on a warm spring day is magnificent. It is, of course, a bit of a thug and needs to have some of its enthusiasm tamed each year otherwise the entire garden would be nothing by clematis! My walk around the garden was just before John decided to wield the secateurs against the roses. The amount of new growth on them was certainly shouting, “Prune me!” It was an interesting reminder of all those new roses we acquired last year, all of which now need pruning, feeding and mulching! I’m now wondering whether the box of rose food I bought is big enough? Whilst roses may demand attention, mahonia is a plant we do absolutely nothing to. We never planted it in the first place but have odd clumps that spring up in both the front and back gardens. The sight of this one about to bud amused me when I saw the result of the photo – it reminds me of one of those strange looking romanesco cauliflowers! As well as the flowers, I took a close look at the fruit trees. The apple trees are yet to show any real signs of buds developing but both the mirabelle and crab apple stems are beginning to swell with new growth. Finally I turned to the veg plot which always looks rather desolate at this time of year. The autumn planted garlic is now shooting well, displaying strong fresh green stems. The chicken wire seems to be doing its job in terms of stopping cats and squirrels digging up the cloves! John has cut the raspberries back but the strawberries desperately need a good haircut. Due to my knee problems, I failed to tidy them in the autumn so they are long overdue some tlc. The remainder is a blank canvas waiting to be sketched out for the year ahead. Of course it’s not all about new beginnings – some plants are already starting the cycle all over again. Hellebores being the obvious example. Ours have been really splendid this year and it’s great to see that there are still buds waiting to open. That said, the pavement next to this one was strewn with stamen, showing that they’re planning ahead and getting ready to self-seed everywhere, which they do rather well! And finally, it’s always lovely to see something return. We bought this Euphorbia Martinii at Malvern last year. It looked great when we planted it but the poor thing got swamped by dahlias and grasses and I feared the worst. Even a week ago I didn’t spot this but here we are, and it’s looking fine! Categories: Blog post | Tags: Buds, Clematis, Daffodils, Euphorbia, Garlic, Hellebores, Mahonia, Mirabelle, Roses, Spring, Wallflower | Permalink. Traditionally October is the month for Harvest Festival services and yet, in our current climate and ways of farming, the harvest is often long gone and put away even by the start of September. For me September is the beginning of autumn although this year, it was the end of July when I first walked out the front door one morning on the way to work and thought it felt different. There’s a sense of coolness in the air and a smell that’s hard to describe but it says that the height of summer is already past and soon the morning ground will be thick with dew. By thinking of 1st September being the start of Autumn, I’ve read that this means I’m following the meteorological calendar as against the astronomical calendar which would mean that Autumn didn’t get underway until later in the month on the 22nd. Either way, now is certainly a good time to take stock of the harvest that the garden has produced this year. 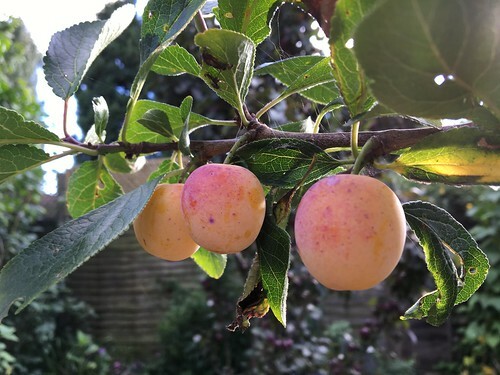 Back in May I wrote about our increased interest in growing fruit and this summer we have really reaped the benefits of this. In June our strawberry plants went mad! In May, wonderful clusters of white flowers burst through thick bushy green leaves and I watched nervously as the fruits began to form. Unexpectedly cold nights worried me. On Gardeners’ World, Monty Don warned that if the centre of the fruits turned black, that meant they had been damaged by the cold. I sighed with relief as ours remained a healthy yellow but I began to worry again as May turned into June and our summer holiday approached. Were these fruits all going to ripen as we crossed the Channel? And if so, who was going to be eating them? Certainly not us! As it turned out, luck was on our side and about a fortnight before our departure a few fruits began to turn red. We started out being thrilled by picking one or two fruits to eat each evening but soon this became ten or twenty fruits – complete bowls full! Gardeners often proudly declare how many pounds of fruit their plot has produced but we were too busy enjoying the fruit to bother counting. As our portions of fruit became larger and larger, eventually I had to draw the line. 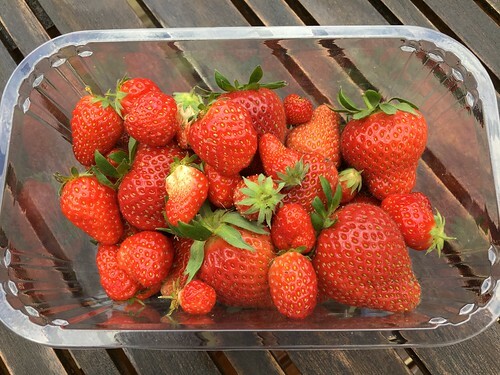 Faced with masses of strawberries the evening before our holiday departure, I declared that it was too much and suggested that we take a punnet with us to eat en route into the Netherlands. So it was that, on midsummer’s day, we found ourselves sitting in the lay-by of a service station in Belgium eating home-grown strawberries whilst watching a flock of sparrows taking dust baths! 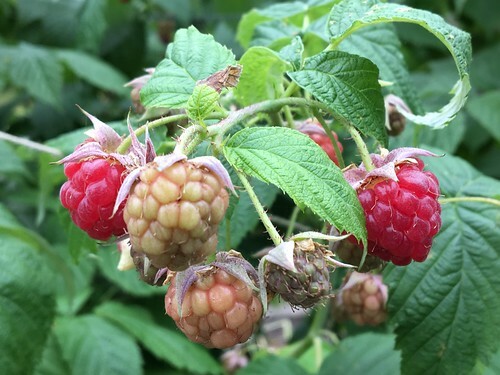 Our raspberries have also been very productive. In fact John was heard to say recently that we may yet be exploring recipes for raspberry jam in future years. Yet again the scale of the harvest crept up on us, from tentatively picking the first few ripe fruits to suddenly realising that we had several punnet’s worth sitting in the fridge. The blackbirds have also been enjoying our raspberries and our blueberries for that matter! My defence of sparkly Christmas wrapping tape tied to branches and supports has not been overly successful in deterring our determined feathered friends. Raspberries have been plentiful enough for us to feel generous towards the birds but their plundering of our blueberries has been less endearing. We strongly suspect that they have eaten more than us! Back in July the cherry plum tree was also laden with fruit which was ripening considerably faster than I was expecting. I have jam jars clearly labelled with ‘cherry plum jam’ and dated 19th August. This year’s crop was ready by 19th July! The very hot spell of weather in June and early July clearly had an effect. Not only were our cherry plums ripening rapidly but a colleague had apricots coming out of his ears! One of the most rewarding sights of the harvest, however, has been our mirabelle tree. We planted our Mirabelle de Nancy about four years ago but it is a tree that has had its challenges. We fell in love with the mirabelle fruit during holidays to Alsace. In September we would pass stalls selling brown paper bags full of mirabelle, a fruit that we had never seen on sale in the UK. Having investigated trees, we finally established the variety, ordered one and planted it with great attention to detail. However, it has been subject to leaf-curl which causes die-back in the branches, and also to fruit withering before maturity. As a result, we have had about two mirabelle in total that have ever tasted remotely like what we had hoped for. This year may well be different. At lunchtime today, we had four mirabelle with yellow skins beautifully blushed with rosy pink that indicated these were perfectly ripe fruit and they were absolutely delicious! We’re a long way from having enough to make mirabelle tarts or mirabelle jam but we are definitely heading in the right direction. Soon it will be time to get the jam pan on the boil again and this time for crab apple jelly. Our tree, Laura (that’s the variety and not a nick-name), is laden. The wonderfully dark beetroot coloured fruits appear to be swelling day by day, presumably due to the rather extreme amounts of rain that have descended during August. Like everything else, it looks like being an early harvest! 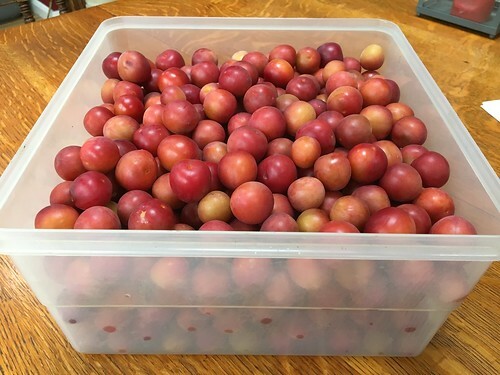 Categories: Blog post | Tags: Blueberries, Cherry plums, Crab apples, Fruit, Mirabelle, Raspberries, Strawberries | Permalink. The desire to grow fruit seems to have crept up on me unawares. When we first moved here, we inherited a relatively young, leaning apple tree of unknown variety and a selection of blackberry and common bramble – both wanted and unwanted! That was it really and for a couple of years nothing changed. Our first venture towards fruit growing was to plant another apple tree – an Egremont Russet which I gave John one birthday as it’s always been his favourite variety. For the past couple of years we’ve had a reasonable crop helped, no doubt, by warm summers which enabled them to ripen properly. At some point we took up an offer in the newspaper of free strawberry runners and planted these up in pots. They have fruited quite well but the plants are now quite old and, without filling the patio with even more strawberry pots, there’s really no way this is enough to produce a decent sized bowl of fruit. The desire to grow more strawberries and also to add raspberries was one of the main drivers for revamping our veg plot two years ago. Our ‘Autumn Bliss’ raspberry canes came in the winter but, as soon as spring sprung, they shot away with bright green shoots. We erected poles and wire to support them, although not quite the sophisticated set up with tensioners and the like as seen on Gardeners’ World! Despite all the expert advice, we succumbed in year one and let them fruit – how can anyone possibly resist? Clearly it did them no harm whatsoever as in year two they not only reached for the skies but also started heading off across the lawn! Now this we hadn’t really anticipated. Everyone knows that bramble and blackberry is invasive but no one warns you about over enthusiastic raspberries! Just slice down the side to stop runners, is the expert advice. Well we did that but to no avail! They are determined to rule the world and we now spend considerable effort in removing them from where they are not wanted! Last year, on the Friday before the May Bank Holiday my new strawberry runners arrived, perfect timing for planting over the weekend. Strawberry runners are just a mass of root with small signs of shorn back leaves and when they’ve arrived in a jiffy bag in the post, they look distinctly unpromising. However, I prepared my row as instructed, sprinkled some general fertiliser, spread out the runners and duly planted and watered in. With the warm sunshine, the following day they already looked settled and I could have sworn were showing more signs of green. The variety I chose was ‘Albion’ and produces fruits throughout the season from June until October – I have since learnt that this is what is known as an ‘everbearer’. There are so many varieties available, however, that it’s very hard to know whether you’ve chosen well. All the reviews suggest that this has excellent flavour but we’re not really convinced – the jury is still out. 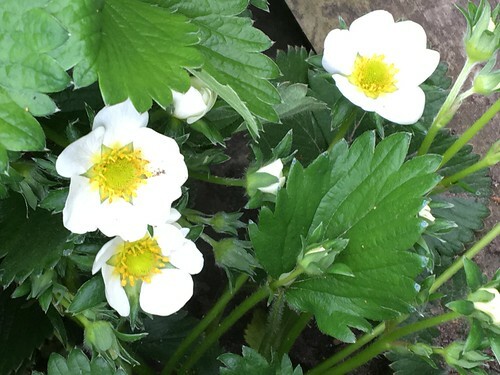 However as year 2 approaches, the strawberry plants have bushed out and are absolutely covered in flowers – I cannot wait to find out what happens next! Meanwhile, our blueberry collection is growing. We grow these in pots as they require acid soil so would fare badly if planted in the relatively neutral soil of our garden. Two of our existing blueberry bushes were selected at random as offers in gardening magazines. One is a tall striking plant that produces lots of berries but also has striking red foliage in the autumn. The other is small and compact and has been less reliable on the fruit front. I have been on the lookout for another of the same variety as the tall one, ‘Chandler’, but it seems quite hard to track down. Two summers ago I became distracted in a garden centre by a new variety called ‘Sunshine Blue’. Another compact variety but bred for patio growing, it was absolutely laden with small pinkish flowers. I just couldn’t resist. It’s a self-polinating variety and produced a bumper crop before almost succumbing to being waterlogged. We have now spent a summer nursing it back to health and this spring it has flowers once more so we have our fingers crossed. However, unable to resist another of those magazine offers, we have three more juvenile blueberries that arrived only a couple of weeks ago and which have now been potted up into small pots as befits their current size. Autumn holidays in France were responsible for us falling in love with the Mirabelle, that tiny yellow plum that packs a huge punch in terms of flavour. However, they are not often grown in the UK and it’s possible that we are beginning to discover why. Our Mirabelle tree, which has just spent its fourth Spring in our garden, flower in late March and produces a tiny delicate white blossom. The flowers eventually turn into small green berries and from then on in it’s a question of all fingers crossed for a tiny crop of plums. This is really exciting as it’s so hard to buy these as fruit in the UK. Occasionally a few boxes appear in M&S for a short period and also in the occasional select greengrocers but to have our own in the garden will be quite an achievement but so far we have had about six and, to be honest, we’ve probably picked them too early to ensure we ate them and not the birds. That said, keeping the tree alive and healthy is all we currently wish for. It seems particularly prone to some sort of leaf curl and eventually this causes die-back. We prune these branches out carefully and hope that they remain disease free. This spring it looks a little more confident but we just have to wait and see – there are no guarantees in the fruit world. And talking of guarantees, our cherry plum keeps us guessing year on year. Often confused with mirabelle, the cherry plum produces small red fruits with deep gold flesh which is very, very sour! However, they do make excellent jam – particularly if you like your jam with a bit of ‘zing’! Three years ago we were inundated with cherry plums and produced pots and pots of jam but we’ve now had two fallow years. This spring the tree was covered in its delicate white blossom and we can see fruit forming so we have all fingers crossed. Categories: Blog post | Tags: Blueberries, cherry plum, Fruit, Mirabelle, Raspberries, Strawberries, Trees | Permalink.